Whanau Ora is the birthchild of MMP. It is the Maori Party’s policy for tribal self determination. While politicians will claim it’s not a Maori-only policy, the documentation shows it is. It has been designed to direct hundreds of millions of taxpayer dollars into empowering tribal groups for self-rule – independent from the state but funded by it. She wants Whanau Ora funding to encompass “the whole fabric of whanau life, including health, housing, education, justice and social services”. Tariana Turia, then Associate Minister of Maori Affairs and a member of the Closing the Gaps Cabinet Committee, explained the agenda underpinning the policy was “iwi self-determination through effecting a Treaty-based partnership… For Maori, the main point of the closing the gaps policy is to ensure Maori are not prevented from having the best possible chance to lead, manage and control their own development”. Through ‘closing the gaps’, Labour was embracing the radical self-determination agenda of the Maori sovereignty movement, and by promoting ‘capacity-building’, taxpayers were being forced to pick up the cost of up-skilling tribal groups ready for separatist self-rule. The policy was on course to deliver massive funding to Maori over and above the level of state funding available to other New Zealanders – that is until Simon Chapple, a senior policy analyst at the Department of Labour, released a groundbreaking report, Maori socio-economic disparity, which exposed a fundamental flaw in the government’s closing the gaps strategy. Using Census and Statistics New Zealand data, the report revealed that rather than widening, the gaps between Maori and non-Maori were closing. While disadvantage did exist, it was found across all ethnic groups. It pointed out that intermarriage had blurred the boundaries between races and that ethnicity was not a pre-determining factor for socio-economic disparity. The paper acknowledged that significant disadvantage was being experienced by some Maori, who lacked education and skills and lived in isolated areas where there were no jobs, but it reiterated that those who are the most disadvantaged in society, crossed all ethnic boundaries, and that government policy to support and lift those families should not be race-based. The paper warned, that policies that are based on the transfer of large amounts of taxpayer funding for the purpose of reducing inequality are doomed to be captured by tribal corporations: “broad based policies which target the Maori population, which may be thought to close the gaps (such as fisheries settlements, other treaty settlements, cheap access to radio spectrum etc,) risk being captured by the considerable number of Maori who already have jobs, skills, high incomes and good prospects”. Opposition to closing the gaps increased. Winston Peters called it “social apartheid”. Dr Rajen Prasad, the Race Relations Conciliator, complained that the affirmative action policies were discriminating against non-Maori, and he recommended that legislative proposals for health treatment to be interpreted in terms of the Treaty of Waitangi, should be dropped. Plunket said poor health was linked to lower incomes, not race. In response to mounting concerns, Labour changed the window dressing. Prime Minister Helen Clark announced that closing the gaps was to focus on people in need across the board, not just Maori. The Closing the Gaps Cabinet Committee was re-named the ‘Social Equity’ Committee. But in spite of cosmetic changes, and the sidelining of some of the more radical elements of the policy, the practice of delivering preferential social services to Maori continued. Fast forward to the 2008 General Election, and when National won the right to form a government, with the support of Tariana Turia’s Maori Party, one of her conditions was the re-establishment of the closing the gaps Whanau Ora policy. In spite of knowing that disadvantage is not race based and that the Maori Party’s separatist plan for tribal self government uses Whanau Ora as a first step, in June 2009 Cabinet approved the establishment of a Whanau Ora Taskforce to plan the implementation of the scheme. At the 2011 election, Whanau Ora became a prominent part of the agreement between National and the Maori Party – the parties agreed to support “the evolving focus and ongoing implementation of Whanau Ora” – and after the 2014 election, the “ongoing investment in Whanau Ora”. Whanau Ora was launched in 2010 amid extravagant claims that independent Maori social service providers would eventually be resourced to the tune of $1 billion. And while National went to great pains – as Labour had done – to point out that this initiative was non-discriminatory and open to all members of society, even a cursory examination shows it is designed by Maori for Maori. There were many teething problems with the programme, which aimed to “empower whanau” and lead to “self-determination”. The Police reported that “Intercepted conversations between Mongrel Mob members reveal they used funding from the Government’s Whanau Ora programme paid to a Dunedin anti-violence trust to buy cannabis for drug-dealing”. The Herald highlighted how Willie Jackson and John Tamihere had put in an application to become administrators for Whanau Ora with a bid that was more than the funding was worth: “Former radio show partners Willie Jackson and John Tamihere were knocked back in a bid to handle distribution of $14 million of taxpayer funding for health and social services because they wanted too much money in overheads. The pair put the total cost of distributing the Whanau Ora funding in the North Island at $21 million. But that figure is almost more than was planned for the entire country.” At the request of Te Puni Kokiri, the pair resubmitted their proposal and are now administrators for the scheme. However, concerns have been raised about accountability, on the basis that even though such private contractors are responsible for dispersing tens of millions of dollars of taxpayer funding, they are not covered by the Official Information Act. In spite of Whanau Ora having been in operation for over four years, the government agencies responsible for the programme have failed to carry out a full evaluation of the overall effectiveness of the scheme. 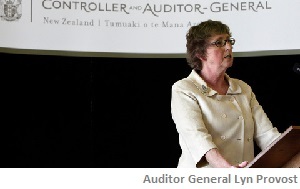 This led the independent Auditor General to undertake a review earlier this year. In her report published last week, she found that of the $137.6 million dollars allocated to the programme, $42.3 million – almost a third – had been spent on administration. While Whaunau Ora providers have been encouraged to join collectives to deliver state-funded services to tribal groups, government agencies have preferred to remain independent: “the Ministries of Health and Social Development had no plans to change to a funding model that would take advantage of the effort and $68 million paid to providers to help them shift to whanau-centred service delivery”. The Auditor General found that the goals and objectives of many of the Whanau Ora programmes were so vague that it was almost impossible to ascertain whether the funding was being well spent. And it is a problem. While those working on Whanau Ora initiatives have no doubt produced some worthwhile results, the programme’s main objective is not about helping people to get jobs and become independent of the state, it’s about empowering tribalism. In fact, like its predecessor Closing the Gaps, Whanau Ora runs the risk of cementing in state dependence through taxpayer-funded tribal self-governance. In her article The Folly that is Whanau Ora, Lindsay says, “I must confess some prejudice against the Whanau Ora concept because it hailed from Maori Party co-leader, Tariana Turia, who would never accept that the Maori teenage childbirth and ensuing heavy reliance of Maori mothers on welfare were undesirable”. She’s right. In spite of the rhetoric, the approach of iwi leaders, with their ambitions for tribal government, has been to turn a blind eye to social dysfunction. They know that increasingly negative social statistics will give them more political leverage to argue that the state is failing “their people”, and that the only way forward is for the government to devolve social spending to tribal control. But here’s the simple truth. Whanu Ora is not going to help Maori become less dependent on the state. As is inevitable with political schemes that lack transparency, have low levels of accountability, and pursue nebulous outcomes that cannot be easily measured, it will become a colossal waste of taxpayers’ money. New Zealand is a country that values freedom and self reliance. The future is being built through hard work and aspirations for a better life. That’s what the government should be encouraging – not state funded tribal self-governance. Whanu Ora is not needed. Our state agencies are more than capable of addressing the needs of New Zealanders, regardless of race. Should the government strengthen or phase out Whanau Ora?